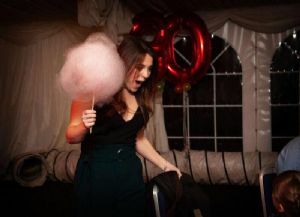 Why not add the extra wow factor to your party with some sweet smelling and delicious candy floss - great for adults and children alike! 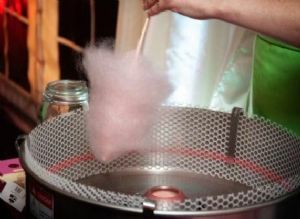 If you are local to Lytham (FY8 area), we can either hire the machine to you and let you have the fun of making the candy floss, or if you prefer we can supply the machine with a professional operator (fully insured and with at least a level 2 food hygiene certificate). We have a large selection of flavours/colours available for your to choose from: Pink Vanilla, Blue Raspberry, Lime, Orange, Pina Colada, Chocolate, Banana, Apple, Sour Lemon, White Citrus Passion Fruit, Birthday Cake, Cherry Berry and Spookie Fruiti (Grape). Candy floss also makes a great take home party bag or special treat. We can also arrange to deliver pre-packed candy floss in a range of colours/flavours for only £1-00 per bag (minimum order of 20 bags). Delivery is in Lytham, Blackpool and Fylde Coast area only. (choose your flavours) Includes unlimited popcorn. ENQUIRE NOW! ENQUIRE NOW! ENQUIRE NOW!